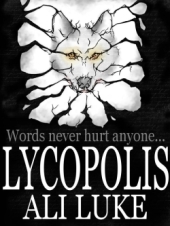 Robert sat in his room and stared at the Lycopolis home page, cursor hovering over the “join now” button. There were plenty of reasons not to. He should be spending his spare time looking into college scholarships and application deadlines. The game was based in the UK, so everyone else would be six hours ahead of him. It didn’t even sound very game-like: more of a collaborative story, all in text, no graphics. Plus, of course, his parents wouldn’t approve. The website promised a dark fantasy world, heroes, villains, adventurers. He’d have to play it covertly – just like, as a kid, he’d smuggled the Harry Potter books into the house. This sounded like a place he could be free. He could be safely anonymous; he could say whatever he wanted, think whatever he wanted, believe whatever he wanted. The application form came up. He’d seen it before, two days ago, when he’d pressed the button the first time. After all, there was no harm in looking. There were boxes for various details: character name, gender, background. He hesitated. He could be anyone – anyone at all. No-one would know that in real life he was Robert, good church-going kid, clean-shaven, wearing a youth camp T-shirt. Background: From the flat lands to the north-east, Heidi has come to study and teach in the newly-created University of Lycopolis. She has blonde hair and pale skin. Like many of the northerners, she doesn’t believe in any gods. He deleted the final sentence, hesitated, then put it back in again. He found himself glancing nervously – stupidly – over his shoulder. His parents were safely downstairs; they thought he was working on an essay. There was a box for his email address. He went to Gmail and signed up for a new account, using Heidi’s name. He didn’t want to get too close to the other players. They didn’t need to know anything about his real life. If his parents found out, or if he just didn’t enjoy it, he could leave and never go back. The form was complete, and he looked at it for several long minutes, then moved the mouse, and clicked “Submit”. After dinner, he mumbled an excuse about homework and slunk back to his room. He checked the new email account, not really expecting a reply yet. But an email was waiting, from seth@lycopolis.co.uk. The subject line was “Heidi”, in quotation marks. He opened it up. I assume you have a real name? He didn’t know what to make of this. Did it mean Yes, you’re in – but I need your name for the records? Or You can’t join unless you give me your real name? Sure, but I’d rather not use it. Is that okay? I’ve set your name as “Heidi” for the Chatroom. You can download the game software from the link below. Robert wasn’t sure how to take that, either. Was Seth joking around with “grudgingly permit” or being serious? As he waited for the software to install, he wondered if he should just back out. There were plenty of other games, after all; fun, straightforward, unchallenging ones. But this was the one he wanted to play. The stairs creaked. Hastily, he switched to his essay-in-progress – but no-one came to check up on him. He wouldn’t log in just yet. He’d wait till tomorrow afternoon, when Mom would be out at Women’s Bible Study and his father would be working. That night, he slept uneasily. The air-con seemed noisier than usual, and he couldn’t get comfortable. He kept thinking about Lycopolis. About Heidi, the character he was going to play. Could she be a good person, without believing in God? It was too late at night to ask questions like that. He pulled the sheet over his head, and tried to think of nothing at all, and, eventually, he managed to sleep. The next afternoon, he opened up the game, typed in “Heidi”, and chose a password: agnosticism. And he logged into Lycopolis for the first time.